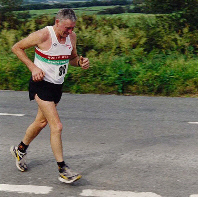 Arfon Jones, Ffrith Galed, always enjoyed taking part in the two mile fun race at the annual Llanddoged village sports, but in his mid-fifties his running became more serious; he entered the 1988 Ras Hwyl Y Ford Gron in Llanrwst. He met runners from the different running clubs, enjoyed their company, and eventually joined the Llandudno based North Wales Road Runners Club. Such was his enthusiasm that he was elected onto the club committee and the weekly Tuesday night training run, followed by the committee meeting, became the highlight of Arfon’s week. He was running almost every week-end at places all over the country and made a host of friends at the different venues. He rarely gained an award but valued the many finishers medals presented to him, among them the New York City Marathon, the Edinburgh Marathon, the London Marathon and the Great North Run. Arfon’s enthusiasm became infectious and a group of his friends joined him in organising a road race to celebrate the Millennium. On Monday morning, 31st July, 2000, a meeting was held in Garej Groesffordd and an organising committee formally elected. With Arfon’s experience a course was planned and Elizabeth M. Clarke a qualified Wales Athletic Association course measurer certified the course to be exactly 12.5k. The race starts at the church and finishes at Cae Cetyn, the village playing field. The local community supported the venture in many ways; 30 marshals manned the course and water stations, the businessmen and Community Council provided finance to purchase the necessary equipment, medals and prizes. The village Sports and Social Committee agreed to provide refreshments at the end of the race and the Headmaster and School Governors agreed to the school being the race headquarters. Arfon distributed entry forms far and wide; the first Ras Fawr Llanddoged took place at 11-30 on Sunday, 1st October, 2000, with 42 runners completing the challenging course. The Race Committee members were delighted with the success of the event and resolved to organise an annual race every September. The support of the local community continues and the runners have increased in number. The tenth annual Ras Fawr Llanddoged, using the same format, was held on Sunday, 13th September, 2009, at 11-30. Arfon Jones took part in Ras Fawr Llanddoged, 2002, on the 29th September; he completed the course but it proved to be his very last race. Arfon passed away during the summer of 2005. His legacy, RAS FAWR LLANDDOGED.As a tribute to the inspiration behind the race, the committee resolved to make an annual award. The first member of the North Wales Road Runners Club to cross the finishing line is presented with Cwpan Coffa Arfon Ffrith Galed and a memento.